Pedaless is an accessory for your bike. It has two main parts. First part is the front part. It is a screen which shows current speed, how many kilometers you have passed or you can pass, it communicates with the motor etc. Components of the front part are atmega328, GPS, Wireless module, OLED Display, Buttons, etc. Second part is the back part. It is where the motor is attached, battery and electronic. The components of the back part are mount for the motor, the motor + ESC controller, battery and electronic. The electronic from the back part is composed from atmega328, ESC controller, Wireless module, heat sensor for the motor, accelerometar, bluetooth, etc. The idea for Pedaless is to have an addition that can be attached to any of the bikes. The bike doesn&apos;t have to be specially designed for this accessory. It weights around 1.5 kg. Completely wireless, the front and back part aren&apos;t connected with wires. Pedaless is an accessory for almost every bicycle that aesthetically has a good position but it&apos;s role is to help the bicycle to move easily uphill. In relation with the aesthetical part I would like to mention that Pedaless is set right under the seat and the motor lays above the back wheel. About the role that Pedaless has I can easily say that it&apos;s a feeling like somebody is pushing you while driving, you don&apos;t even have to move your pedals. Maximum speed I have achieved is about 40km/h and the distance with only one charge of the battery that is 24V with 7Ah was about 10km. It was enought for me to get to work and charge the battery there and then come back home. The Front part I call Dashboard, which is the part that the motor is controlled with and the Back part I call it Motor. The communication with the Motor happens with multiple devices. Those devices can be the Dashboard or your mobile phone. It is irrelevant whether you&apos;ll be using android or iPhone. In next video is presented speed and power of motor, speed in flat ground was around 40km/h. Dashboard is the device that calculates the speed with the help of the GPS. It also calculates the distance that you&apos;ve passed with one charge. Other main elements are the three buttons that represent actions like menu, up and down, as well as OLED display, analog optional socket and wireless module. With clicking the &apos;Menu&apos; button you can change screens. It has multiple screens. First screen is the main. On the main screen you can see the speed, odometer, communication, battery and throttle power. Second screen is where some parameters can be set. On the last and third screen you can see statistics about how many kilometers you have passed and how much time was spent driving, how many times the motor was driven etc. In next video is presented how works motor. Communication with the motor is wireless and it&apos;s duplex communication. The dashboard sends data, how much power the motor will use. If the analog throttle isn&apos;t connected then the power is controller with the UP / DOWN buttons, otherwise it will be controlled with the analog throttle. The Motor is the device that is positioned in the back part of the bicycle, right underneath the seat. The parts that the motor is made of are holder for the motor, that also holds the ESC controller and the electronics. Main part from the electronics are wireless module, bluetooth, accelerometer and temperature sensor. Wireless module provides communication with the Dashboard device. Bluetooth module provides communication with the mobile phone instead of the dashboard device and it gives the opportunity to program the motor remotely via iPhone / Android, not need to have PC near you. Accelerometer is one of the safety modules. His role is to block the motor from running if the bicycle is tilted on the side and to stop it from moving the bike. The other safety module is the heat sensor that prevents it from overheating. When certain temperature is reached it turns the motor off. Pedaless will contribute to having easy, safe and faster ride, whether you are going to work, school or other destinations. Pedaless will help you keep moving if you get a little tired of turning the pedals or going uphill. Anytime you want or need it you can use it just by pressing throttle. Simple enought to use. That two versions of this image one wired version (Lite), and wireless version (ProDashboard and ProMain) are tested completely working. Here is soldered version of them, i have started design new versions of this where im planing to increase space for a 15mm in height. It will include better buck converter and direct in and out for ESC Controller. I get my new PCBs from SEEEDS factory, quality is much better then before from other company. In picture is presented 2 type of Pedaless. Lite version is wired, Pro version is wireless version of Pedaless. Because many of people wondering about tires because motor rotate tire. So i want to show you after 8 month of driving bike to see difference between front and back tire. And yes there is difference of course but new tire is around 10euro here where i living. With my expectation around 20 month of driving you will need to change tire. Finally is there. Tested, worked version of wireless prototype of Pedaless. In next two images you will see wired and wireless version of Pedaless, both works like should work, but one is more modular. Here is first version of Dashboard wireless type, it contain FTDI pins for programming, Display present speed, power, 3 temperatures, battery indicators and odometar, pin for throttle, pin for wireless module,button for menu and battery. Version is tested and working very good, without delay. Here is first version of Mainboard wireless type, it contain FTDI pins for programming, ESC pins to control ESC Controller, Temperature pin for Motor, Temperature pin for ESC Controller, Temperature pin for board and pins to connect wireless module. This version is already tested and working with prototype version of Frontboard. Here is first version of Mainboard wired type, it contain FTDI pins for programming, ESC pins to control ESC Controller, Throttle pin, Temperature pin for Motor and Temperature pin for ESC Controller. This version is already tested and working. I was think to make some better dashboard, to fit nicely with throttle, and i think i will work on it bike ring bell. I buy 1$ ring bell and i remove all parts except finger thumb. That finger thumb i will use for analog throttle, im thinking to use hall sensor to read magnetic field or maybe i will use something other. In images bellow you will see how look PCB and how all that fit in ring bell. I will make 3D print for cap of this ring bell because i want to use 3 buttons and display so all that will fit nicely inside. I decide to make battery from laptop batteries. Battery type is 18650, in this case i use 30 cells, 6 batteries in serial and 5 in parallel. ESC Controller that i have it can handle 6S battery. Right now i don&apos;t have BMS for this battery, so i will use Pedaless to read voltage, so if drop bellow X voltage i will STOP motor to protect battery. For charge i ordered IMAX B6AC charger. After few prototypes i decide to make simple wired version of Pedaless. This version does not contain dashboard, that mean only need throttle button on front of bike to be connected wired with Mainboard Wired PCB. This version also contain voltage sensor so you can set cut off voltage and protect battery from damage. I like how the motor retracts when not powered. Is there a spring that swings the motor away from the tire? More specs on the key parts would be good. Motor: what diameter, volts, amps? ESC: amps? How about links to online store (ie. HobbyKing) to buy these parts? Hi Kris, thanks for interesting my project :) ... About how motor come to tire and go away is pretty simple solution....because is power motor, inertion of rotation is pushing to tire, and opposite... you can see that in this video..
but on last test, i put around 1cm away from tire so in lower speed to put on tire also. Motor: I know is 63XX series but not sure what model, but is similar like this. How was the batteries soldered in an array? He was put 2 layers of plate and with some machine he soldering. In the end of plates is PLUS and MINUS, there was solder so it was easy for me to make ends of the battery. This looks like an electric version of the French Solex from 70 years ago. Same type of transmission which was argued not to be very efficient. 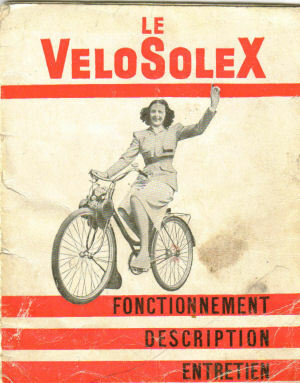 The Solex has a two-strike engine and drives the tire of the frontwheel. The Solex fans are alive and kicking in Europe (I am not one of them). Bosko! I totally overlooked that you did that, otherwise I would have liked to talk with you about it at the Belgrade conference... My bicycle computer project is asleep for a while now, but I have to link your project in a log there, so hopefully some more people will see it. Great stuff! Hi @davedarko, thanks anyway for PCB #Tote HaD :) . I notice that you have same speedometer like i have. Some of my old versions without GPS was with magnetic sensor, but was Wireless with NRF24L01, i will put in "logs" that also with video. Thanks again! it was nice to see you in Belgrade. Thanks @Austin Marandos, wait to see new improvements, soon i will put new "logs" to see that. Im planing this summer to drive on my bike new version. Motee is a smart motor controller focused on you. Everything's onboard! Motee: The motor controller. Reinvented. You are about to report the project "Pedaless - eBike innovation", please tell us the reason.